Kinda like eating a bowl of cornbread with buttermilk, a local old-timey favorite. TOASTing the cornbread is a must for crunch. Use real maple syrup or local honey and plain yogurt. This whole milk yogurt with the cream-on-top from the biodynamic Seven Stars Farm is hard to beat. This is also a good simple desert that kids and grownups love. Weather update: Still snowing here. Asheville Artisan Bread Festival 2013 – Its Local and Delicious! Mark your calendar. The Asheville Artisan Bread Festival, organized by baker Steve Bardwell, is in its ninth year and well worth attending. The atmosphere is charged with the enthusiasm of local bakers & bread lovers; its hard not to be caught up in the fervor! Held from 10 – 2 at the Magnolia Building on the A-B Tech campus in Asheville, NC ~ this is your chance to sample and compare the breads from many regional bakers. If you buy a loaf of bread before they run out of tickets, you might get a free ticket to attend one of the baking classes. Held from 10-6 at the Magnolia Building on the A-B Tech campus in Asheville, NC. For bread-enthusiasts who want to improve their baking skills, there will be many workshops and lectures at A-B Tech taught by Craig Ponsford, Peter Reinhart, Lionel Vatinet, Emily Buelher, Eduard Thijs, and Jennifer Lapidus. 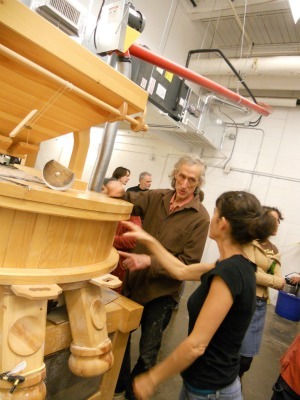 There is also an off-campus opportunity to explore wood-fired baking with Bob Bowles. All the classes sound enticing. I am signed up for the pastry-making class and the gluten-free baking class. Tickets are required for all the workshops. Thinking of taking a bread class? Plan ahead because space is limited and classes fill up quickly…in fact many are already sold out – so sign up right away. Check out the class schedule here. Craig Ponsford graduated from the California Culinary Academy with top honors and opened Artisan Bakers with his family in Sonoma California in 1992. In 1996 his breads won the Gold medal at the Coupe du Monde de la Boulangerie in Paris. He then went on to coach the US Team to victory in 1999. He has coached each U.S. team since and served as U.S. judge at the 2002 and 2005 Coupe du Monde and 2007 Louis LeSaffe Cup held in Argentina. Currently, he is an instructor at the Culinary Institute of American in St. Helena, California and has his own bakery/innovation center, Ponsford’s Place, in his home town of San Rafael. Peter Reinhart, currently chef-on-assignment at Johnson & Wales University in Charlotte, is the author of eight bread cook books, three of which have won the James Beard Award. He is a widely respected teacher, author, and consultant. For a more complete listing of Peter’s accomplishments, see http://www.co.lincoln.nc.us/DocumentCenter/Home/View/1368. Lionel Vatinet, a French master baker, teacher, baking consultant, author, and owner of La Farm Bakery in Cary, NC is one of America’s most respected experts on artisan bread. He has dedicated his life to sharing his knowledge, consulting nationwide and abroad for bakeries, training bakers in Europe, the Middle East, Central and South America, Canada and the United States. In 1995, Vatinet was the founding instructor at the San Francisco Baking Institute, the first school of its kind in the US. Bakers from the most respected bakeries in America – La Brea, Acme, Zabar’s and Panera – traveled to SFBI to study with Vatinet. For more information contact Steve Bardwell at 828-683-2902 or wakerobinfarmbreads@main.nc.us. http://www.ashevillebreadfestival.com. their new baking facility and (once they sell their home in Sylva) they plan to move to the Asheville area. Right now they have a very long daily commute. We wish them all the best! The mill at Carolina Ground is up and running after various electrical snags. It is an absolutely beautiful piece of machinery that was hand-made in Austria. Jennifer Lapidus, director of the North Carolina Organic Bread Flour Project, was busy showing folks around and explaining the workings of the mill. As one of the many Kickstarter donors to the mill project, I came home with a bag of Turkey Wheat Flour…freshly ground by the new mill! I can’t wait to bake some bread with it. This was followed by a delightful dinner of fabulous food and exuberant conversation. 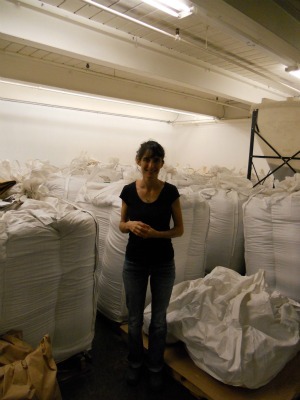 Jennifer Lapidus in front of various grains that are waiting to be milled. The grain was raised organically by Kenny Haines in Eastern NC. Bread lovers alert! Where can you find all the best bakers in the area in one place at one time? The Artisan Bread Festival! The eighth ASHEVILLE ARTISAN BREAD FESTIVAL will be held this Saturday, March 24, 2012. This is your chance to sample and buy breads from area bakers, AND attend hands-on workshops and lectures about artisan baking, milling, and wheat itself. The fest happens from 9am to 6pm, with the bread tasting & sale from 10 – 2, and workshops from 10 – 4. Everything will be held at AB Tech in the Magnolia Building, with an Open House and a Bakers Guild Dinner to follow the event at 128 Bingham Road (see details for the Bread Fest, Open House, and Dinner below). Please note AB Tech location! Last year this part of the festival was held at Greenlife Grocery. The bakers will be selling only at AB Tech this year. This is your chance to SAMPLE and BUY lots of amazing breads…and meet the bakers behind the bread. Buy a loaf and get a ticket to one of the Bread Fest Classes while supplies last. Author Treska Lindsey will also have a booth selling her wonderfully written and illustrated book – “How Batistine Made Bread”. In conjunction with the Asheville Artisan Bread Festival, Carolina Ground http://ncobfp.blogspot.com/ will have an open house at their newly running flour mill. 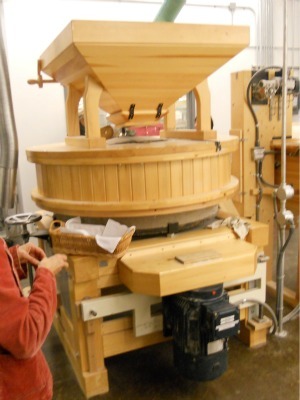 This beautiful mill will grind flour for local artisan bakers, specifically organic grain that was raised right here in North Carolina. Plus Annie’s Naturally will be celebrating their expansion in the same building – a new wholesale and production facility at the former Square D plant at Bingham Road. Directions link. There will be a Bread Bakers Guild of America Guild Hall Dinner starting at 6:30 in the same building as Carolina Ground and Annie’s (128 Bingham Road, Suite 350, Asheville 28806).The dinner costs $30, includes wine and beer, and will be catered by the Culinary Commandos (recommended by Mark Rosenstein). There are a limited number of seats that are mostly full…so if you want to attend, arrive early and take your chances on getting a ticket. Have you ever attended this awesome event? Don’t miss it! The seventh Asheville Artisan Bread Bakers Festival will be held at Greenlife Grocery this Saturday, April 2, starting at 10 a.m. This isn’t just any old average bread…these bakers know the secrets that coined the term “staff of life”. How are they are able to get that wonderful crumb (the inside of the loaf) surrounded by a nice crunchy crust? 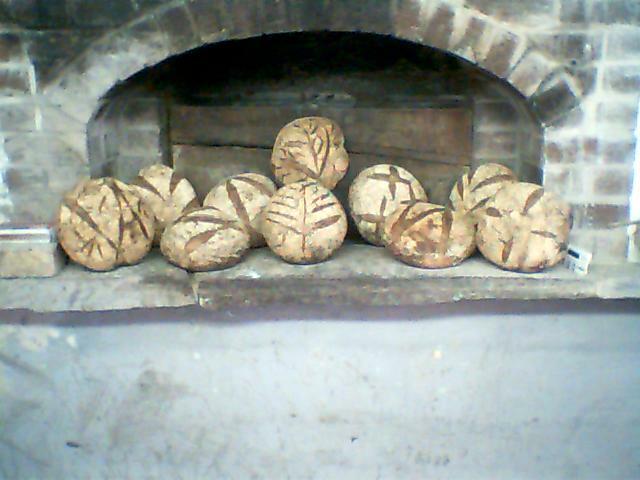 There is some serious baker know-how involved, and a lot of this bread is hearth-baked in a wood fired oven. Make a sandwich on one of these loaves, and you’re talking instantly gourmet. Delectable savouries and sweets will be offered too…which usually includes the best croissants ever. Over fifteen local bakeries will be offering tastings, and loaves & baked goods will be for sale. Stock up! Bakers will be manning their tables until 2 p.m. Simultaneously, from noon to 6 p.m., the Asheville Artisan Bread Fest will be offering hands-on workshops & classes. You can purchase tickets to the classes for $10 (each class) online through NOON of Thursday, March 31, or before and during the Bread Festival. A limited number of tickets will be available free through the bakers when you buy a loaf of bread. Some classes are already sold out! Any profits from the Bread Festival will be donated to Carolina Ground http://kck.st/dRWAuR (NC Organic Bread Flour Project). 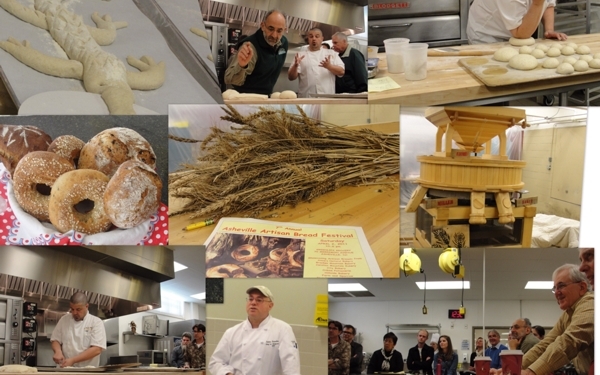 See http://www.ashevillebreadfestival.com for the class schedule which features hands-on baking classes with Didier Rosada of Uptown Bakers near Washington, DC, Lionel Vatinet of La Farm Bakery in Cary, NC., Mark Rosenstein, local chef & author (sold out), and Emily Buelher (baker & author). Peter Reinhart (baker and author), Joe Lindley (miller), David Bauer (baker), Antoine Guerlain (oven mason), and Jennifer Lapidus (baker & director of the NC Organic Bread Flour Project). This is a fantastic opportunity to learn something from the professionals, and get inspired. If nothing else, just come buy some bread for supper! I hear that Treska Lindsey may be at Farm & Sparrow’s booth selling her wonderful children’s book, “How Batistine Made Bread”. This book is a must for anyone who delights in fresh-baked bread…or just loves life itself. Artisan Bread Festival on Saturday! If you love bread (I do), and even better…if you love baking (I do), this festival is for you. Show up at Greenlife Grocery this Saturday morning, March 20, and you’ll find 14 different bakers (bakeries) crammed into Greenlife for the festival. You will be able to sample amazing breads and meet the bakers, though they will be too busy for an in-depth conversation. It’s super busy and the small space is packed with people. When you buy a loaf of bread you can request a ticket to one of the baking classes (free with a purchase from one of the bakers). Classes include Hand Kneading for Beginners, Linking the Farmer, the Miller, & the Baker, Artisan Breads Every Day, Country French Bread, Whole Grain Breads, and 2 Wood-fired Brick Oven Workshops. Teachers include Emily Buelher, Jen Lapidus, Peter Reinhart, Lionel Vatinet, Mark Rosenstein, and David Bauer. These are all great bakers with loads of experience; some are well-known globally for their books on baking! Wow. These classes are held at various locations ~ Greenlife Community Center and A.B. Tech, with directions provided to the wood-fired oven workshops. If you want to attend a class, here’s the trick: Show up early. To attend a particular class, find a baker who still has tickets available for that class, and buy that bakers bread. Of course, I never make it out of the Bread Festival without at least three wonderful loaves. I do have a freezer! The Artisan Bread Festival runs from 10 – 2 at Greenlife Grocery on Saturday, March 20. Classes run later. For more information contact Steve Bardwell at 828-683-2902 or wakerobinfarmbreads@main.nc.us. or go to http://www.asapconnections.org/breadschedule2010.pdf. “Heavy snow predicted!” That’s all the encouragement I needed to get in the mood for bread baking. What could be cozier? 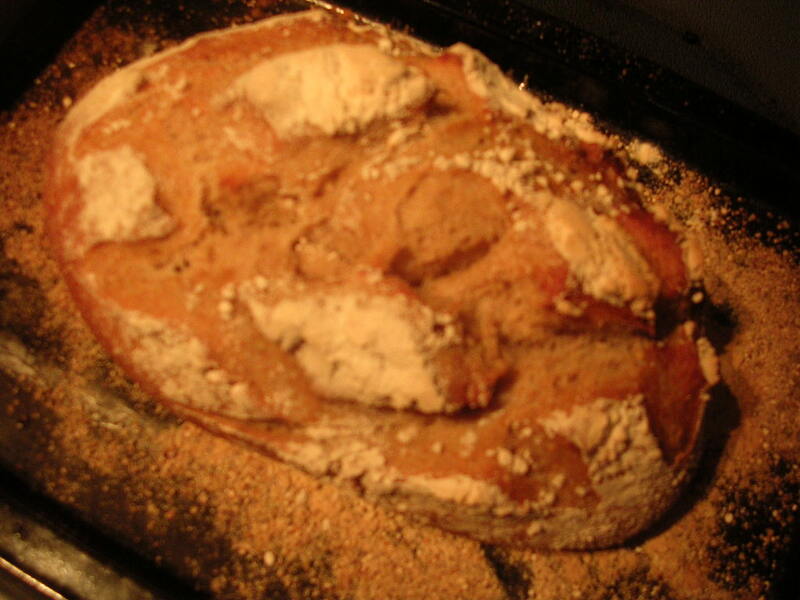 I had an article laying around somewhere about artisan bread baking, the mystery was where? Gave up, and tried a simple recipe that involved 4 ingredients: flour, water, salt, and yeast. The rising time could be up to 5 hours which fit my schedule, so I stirred it up, kneaded it, and went about my business while the bread rose. Here’s the loaf just before it went in the oven. The oven was preheated to 450 degrees, with a cast iron skillet heating on the bottom oven rack. 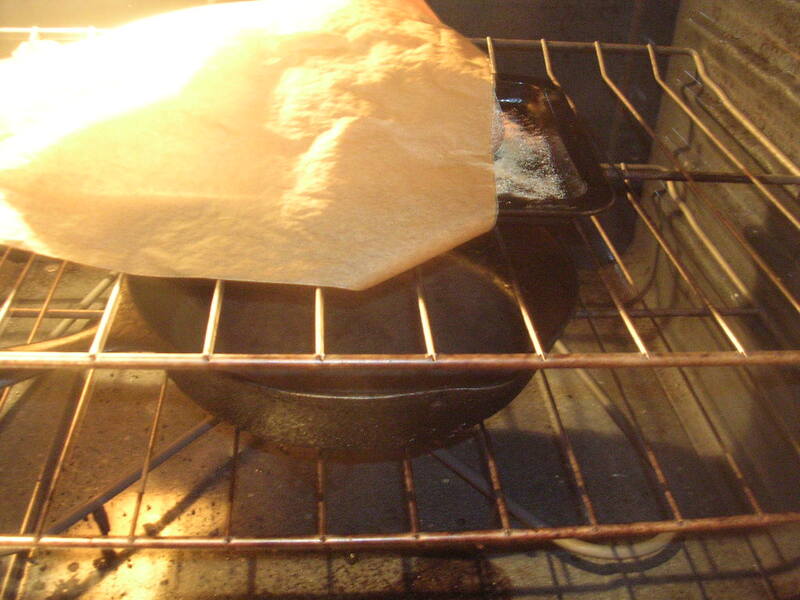 I quickly opened the oven door, popped in the bread, pulled out the rack with the skillet on it, and poured a cup of boiling water into the hot skillet (very carefully because the steam is exceedingly hot), and pushed the skillet-laden rack back into the oven. 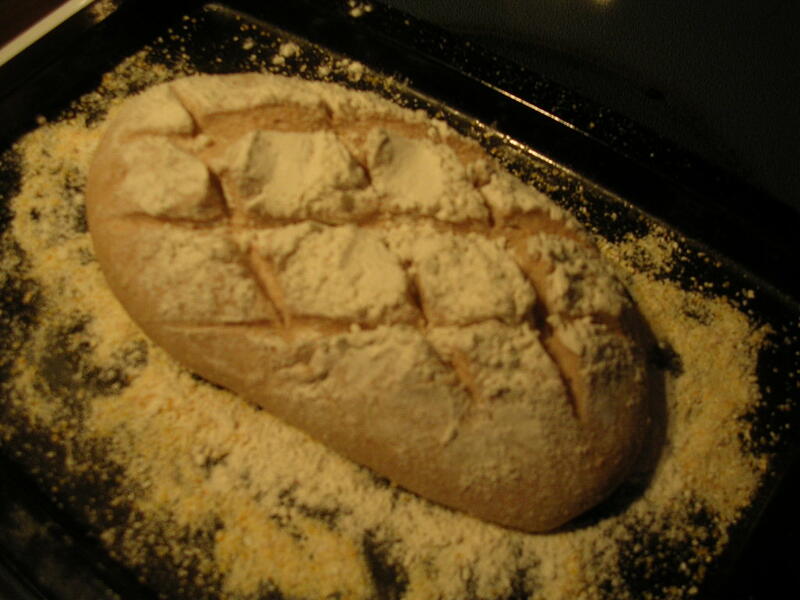 Then I quickly covered the loaf with a piece of parchment paper, closed the oven door, and let it bake. When it was done baking, I pulled off the parchment paper and baked the loaf a couple more minutes for a consistent golden brown crust.